Many of us know the phrase, “strength in numbers,” but is the strength actually the numbers or the type of people that make the numbers? This week’s guild has a definite strength and they are a close knit group, but it is not from their numbers. The Skyhound Adepts is a smaller guild and might not even be one people would notice. I have to say that in the short time I have been in their forums, emailed, and replied to members the more I understood that their “strength in numbers” comes from the quality of the people that make up those numbers. How did Skyhound Adepts get its start as a guild in SWTOR? Is this the only game Skyhound Adepts are associated with as a guild? -Before the release of the game, my friends and I decided to get into beta; we fell in love with the game and decided that we would make a guild. Trying to think of a ‘Snazzy’ name for the guild, it kind of just came to me. So the Skyhound Adepts were born! -This is the first guild with this name, though most of us are in the Redmage Bandaids in WoW, and plan on making a Skyhound Adepts guild in the upcoming game ‘Secret World.’ Got the beta and plan on reserving the name as soon as possible, to preserve it from copycats. What is the type and name of the server that the guild Skyhound Adepts is located? Skyhound Adepts is a really a small close-knit group of gamers. How does the guild plan to keep this close-knit feeling as the guild grows? -We have a Forum on our website for the community of the guild, and recruit on many levels to ensure everyone has someone to play with. We also make it a point to plan times to run through flashpoints with each other, and do the endgame Ops as well. Recently, a guild bank was set up, where people who have proven that they intend to stay with the guild have the ability to trade items such as high-level orange gear, and schematics. We also are saving money to help new players pay for the annoying speeder training. 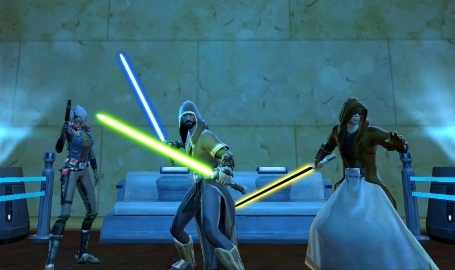 What has been one of the guild’s biggest achievements in SWTOR so far? -Near the beginning of the game’s life, when most ‘high level’ characters were 20-30, the guild filled an entire ops group for PVP, and on the Alderaan Warzone, managed somehow to hold ALL three turrets, and keep them the entire game. It was pretty triumphant. Has the guild started running Operations? If so which ones and what difficulty levels? -We have not run Ops as a guild, though a few members have already, there are plans in the future to run as a guild once we level some new recruits. Does the guild enjoy the PVP Warzones? Is there one in particular the guild enjoys the best? -Most of the guild loves PVP matches, and always make sure to complete the daily mission. The favorite of the group seems to be Alderaan’s map, and the group groan is Huttball. As guild leader, what has been some of the biggest challenges running a guild? Are there some tools Bioware could add in-game to help you and the officers run and grow the guild? -I’d say the biggest challenge was to recruit members and motivate them to work together, some people just join guilds and ask for items or hardly talk. I also had to work to get the funds for the guild bank, though I received a wonderful donation by Neda, a new member at the last minute. -The Officers have addressed a few ideas, and the two biggest ideas we have is “automatic donation” to the guild bank(a percent of all money loot is deposited in the bank for the guild to share), and guild perks, like a separate experience bar for the guild, and as the guild levels up, small perks are added. I noticed the guild is organizing to get its guild bank. How has this process been working out for the Skyhound Adepts as a small sized guild? -As a small guild, the money total was difficult at first, then Daschund donated, and Neda practically PAID for the bank, and we now have it set up, thank you two very much! What is the class, advance class and level of your main character? 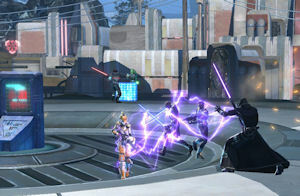 As the guild leader what has been your favorite in-game feature or game mechanic in SWTOR? What is your opinion on the Legacy System so far? -My main character is Anna’lis, a level 43 Republic Commando. I had to take a break from her and start a few alt characters to help the new members to level and quest. One of my favorite things is the dialogue. I like the ability to shape my character in more than just item looks and stats. Other than that, doing PVP, flashpoints, and ops as a guild has been pretty fun. -The Legacy System is pretty interesting, though we are looking more forward to the XP bonuses to be released soon for legacy. Adding a name to your legacy is also fun, as other players can see you and know “hey that’s one of so-and-so’s characters!” The family tree is somewhat lacking, as we would like to have multiple lines, like have someone an ally to more than one character. Ispen, a guild officer, weighs in with her favorite game mechanic in the quote below. One of my favorite things is the dialogue options. I love having light/dark side choices. The more evil choices you make, the more dastardly your character starts to look. Ispen’s looking pretty evil. 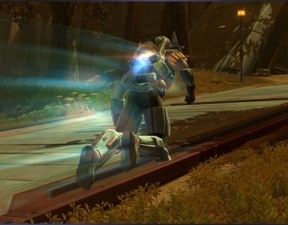 Rani, a guild member, tells us their favorite game mechanic in SWTOR. I love the “storying.” I love the good/bad choices. I love the fact you don’t have to be 100% good or 100% bad. I guess I’d change how quiet everyone is with each other. Of all the times I’ve been logged on, I’ve only ever seen general chat once. Neda, a guild officer, lets us know one thing he wishes would be allowed in PVP. I love the new rocket boots most of all, but wish they would last longer and be usable in PVP. Is Skyhound Adepts currently recruiting? What classes/advance classes does the guild need? -Yes, we are currently recruiting and welcome new members, both Empire and Republic. We are recruiting along many levels and classes, and all are welcome. Our hopes is to create a strong community that helps each other out. Along the lines of recruiting, is Skyhound Adepts trying to start a Sith chapter of your guild? Is this to help your members with their Legacy benefits? -We do have a sister guild called <Hellhound Adepts> recently set up. It’s a little of both, we want to help with the Legacy system, and also some people like Sith, some people like Jedi, we decided to have a guild that liked both. How can potential recruits or those looking to find more information about the Skyhound Adepts contact you all? They can visit our website, or contact one of our guild officers, Anna’lis, Corthewin, Ispen, or Neda for the Republic side, and Skarro, Cortano, Telbeler, or Zombie on the Empire side. Guilds should not be judged by their size…because it is the strength of character and willingness for members to help each other that is the measure of a successful, productive and enjoyable guild. That’s it for this week’s Guild Checkpoint. I want to thank all the members of Skyhound Adepts for all their help and welcoming me into their website/forums. I also want to especially thank the GM Anna’lis/Mediaflare for all his work and time helping with this article. If you are looking for a guild that enjoys having fun, is growing to include Operations in their guild events and even creating a sister guild on the Empire side, you should get in touch with the officers and apply today. Does your guild have a close-knit vibe? Or maybe your guild is huge into Warzones or Operations? Whatever your guild is into or does for fun in SWTOR, let us tell the community about your guild and what it is all about. All you need to do is email me at jason@corellianrun.com along with your guild’s website address and we will see if we can get your guild highlighted on Guild Checkpoint at Corellian Run Radio.